Marilyn Ronoh is a part time lecturer and a final year PhD student enrolled in the University of Nairobi’s School of Mathematics. She is also a recipient of the 2018 Mawazo PhD Scholars program. 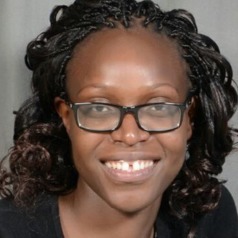 Her research title is “Mathematical modelling of HIV transmission dynamics coupled with awareness among adolescents and young adults in Kenya”. Outside her research, she is a member of the Kenya Women in Mathematics Sciences Association and is passionate about mentoring high school girls and showing them the positive side of mathematics.